3. Display - 6" IPS display from AUO, brightness, contrast, color temperature, sRGB coverage, etc. Oukitel continues its line of ruggedized smartphones with large batteries but has decided to create a separate series for them - the WP one. 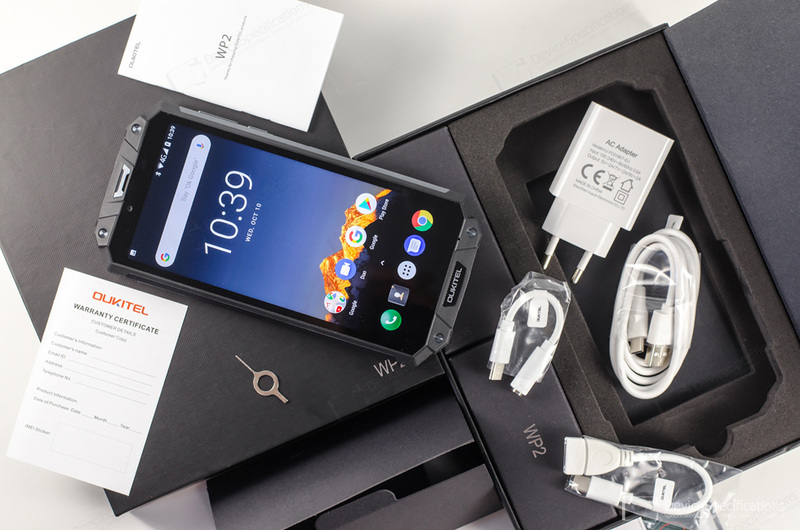 The first device from the series is dubbed Oukitel WP2 and couples a tri-proof rugged body with a 10000 mAh battery. In a way, this model can be perceived as a successor of the Oukitel K10000 Max, which also boasts a battery of the same capacity and a ruggedized design. At the same time, the manufacturer tries to keep the price within a more perceivable frame, achieving a very good all-rounder created especially for professionals, great outdoors enthusiasts, sportsmen and everyone who needs a reliable companion in tough environments. 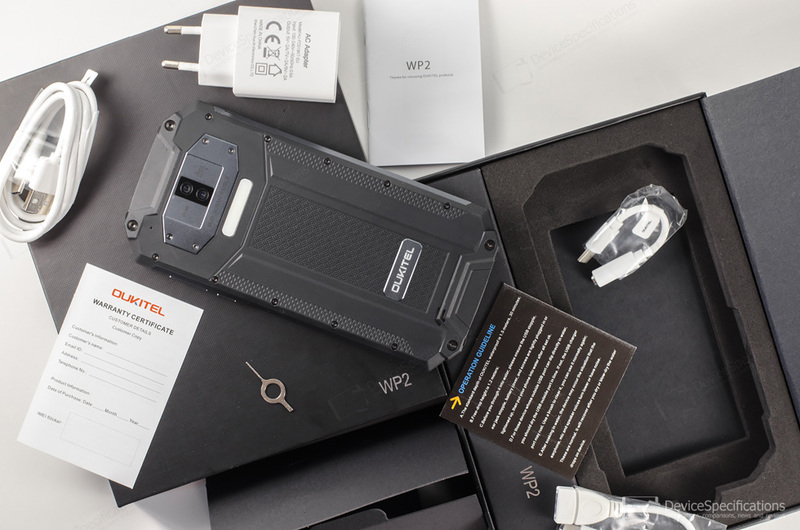 Let's start with an overview of the WP2 specifications and check out what's in the box. Oukitel WP2 is equipped with a 6-inch display from AU Optronics. This is a 10-point touch in-cell IPS unit with a resolution of 1080 x 2160 pixels and an 18:9 aspect ratio. The screen is protected by a Corning Gorilla Glass 2. The body combines an aluminium alloy frame and various materials that make it dust and water-resistant (IP68) and shock-proof as well. In addition to toughness, the handset promises a long battery life. It is equipped with a 10000 mAh unit that promises up to 50 hours of talk time and up to 670 hours of standby time. It is paired with a 5V/2A~7V/2A~9V/2A fast charger. Performance-wise, the model is based on a MediaTek MT6750T chipset. It features an octa-core Cortex-A53 CPU with four 1.5GHz cores and four 1GHz ones combined with a dual-core 650MHz Mali-T860 MP2 GPU. The RAM and storage measure 4GB and 64GB, respectively. The RAM is single-channel, LPDDR3, clocked at 833MHz and the internal memory can be expanded with up to 128GB. Oukitel WP packs a 16MP Samsung S5K2P7 main camera on the back adjoined by a 2-megapixel sensor - most probably a GalaxyCore CG2035/2145 one. The main shooter has an f/2.0 lens and is aided by a very bright quad-LED flash. The front-facing shooter is equipped with an 8MP GalaxyCore GC8024 sensor and an f/2.8 lens. It supports face unlock. The model has a side-mounted fingerprint sensor. It supports 2G GSM (850, 900, 1800, 1900 MHz), 3G W-CDMA (900 MHz, 2100 MHz), and 4G FDD-LTE (800, 900, 1800, 2100, 2600 MHz) networks with Cat. 6 LTE speeds. Its wireless connectivity options include full NFC capabilities, Bluetooth 4.2, dual-band Wi-Fi 802.11 a/b/g/n, Wi-Fi Direct and Wi-Fi Hotspot. The smartphone works with GPS and GLONASS. It arrives with a USB Type-C 2.0 port with OTG support and lacks a 3.5 mm jack. The onboard OS is Android 8.0 Oreo.